Pixar Animation Studios and The Walt Disney World Company go together better than Dole Whips and Mickey Ice Cream Bars! These mind-blowing animation entities officially joined forces in 2006, when the Walt Disney World Company purchased Pixar. This enormously beneficial relationship has made the animation experience jump leaps and bounds! Thanks to the partnership, we now have a whopping 20 Pixar themed experiences to enjoy at Walt Disney World. An entire land devoted to a Pixar film franchise? You bet! 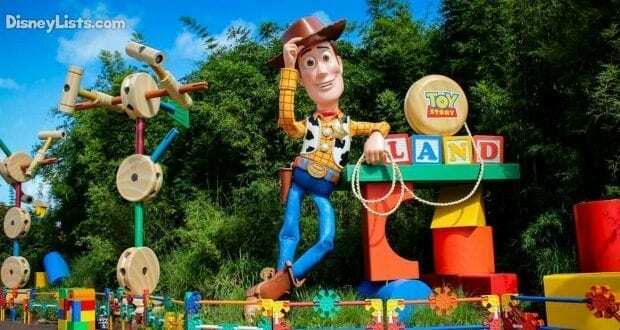 The new Toy Story Land at Walt Disney World Resort, inspired by Pixar Animation Studios’ Toy Story films, turns guests of all ages into “honorary toys” and allows them to “play big” in the whimsical world of a child’s imagination. A world of toys surrounds guests: giant building blocks, Tinkertoys, yo-yos, board-game pieces, dominoes, Scrabble tiles, and even a giant roller coaster set. The entire land encourages the best playtime ever. It really is a very cool themed land. The land is very immersive and you’ll actually feel like you are in Andy’s backyard. It tops our must-do list! Simply incredible – Finding Nemo The Musical in DinoLand U.S.A. at Animal Kingdom should be on your must-see list! We absolutely love this musical where a talented cast sing and present a theatrical experience through puppetry of the Pixar/Disney film, Finding Nemo. If you think back on Finding Nemo, you will remember that the movie wasn’t at all a musical. There really wasn’t a lot of songs in the movie and it was more about the story. That means that most of the songs in the musical are originals that were created just for this stage version of the show, so you and your family will likely leave with some new songs stuck in your head! This is the first time that Disney had made a musical stage show from a non-musical film. We’re so glad they did! 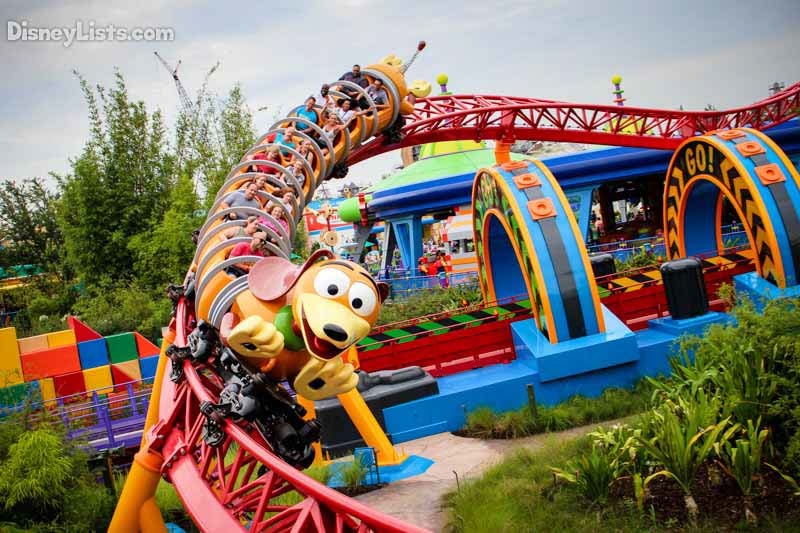 The main attraction for Toy Story Land is Slinky Dog Dash. From his Dash & Dodge Mega Coaster Kit, Andy has assembled his roller coaster for maximum family fun. But instead of just using the roller coaster vehicle that came with the kit, Andy has put his Slinky Dog on the track. The result is a family-friendly thrill ride around the backyard that includes two launches. Tracks and supports in bright colors of red, orange, yellow and blue were snapped together according to Andy’s hand-drawn plans. Rex and Jessie helped by stringing lights above Andy’s stacked Jenga game pieces. Riders of all ages delight as Slinky Dog bends and twists his coils (you’ll hear that sound on the ride) around curves, over hills, and down drops in the Slinky-est coaster ever. In each 18-passenger coaster train, riders zip around and above Toy Story Land, catching great vistas of all the new land has to offer. In a first for a Disney coaster, Slinky Dog Dash features a second launch at its midpoint as riders experience cool sound effects and spinning lights, darting through a series of rings. You’ll actually be pulled back, just like you would pull a toy car back before you dash forward on your way to the attraction’s finale featuring Wheezy, the squeaky penguin from the Toy Story films. The second attraction added to Toy Story Land is a spin ride called Alien Swirling Saucers. Brace yourself for out-of-this-world thrills because the Aliens have powered up their flying saucers! Alien Swirling Saucersimmerses guests in the playful world of Andy’s imagination. This galactic space toy is designed as a playset Andy won at the Pizza Planet restaurant. The adorable little green Aliens from Pixar Animation Studios’ Toy Story swirl about in toy rocket ships with guests in tow, while “The Claw” hangs overhead. Two sets of 11 saucer/rocket-ship pairings spin guests through a multi-colored galaxy to a raucous, energetic musical beat. An attraction so popular Pixar Place at Hollywood Studios had to add an extra ride track! Toy Story Mania is a must-do of ours that we simply can’t get enough of. Even with the addition of two new attractions in Toy Story Land, this attraction continues to have a long wait time! Ride along while blasting targets and wearing 3D glasses to get the most of this 4D attraction. It’s fun to see all your favorite Toy Story characters cheer you on as you rack up the points arcade style. Stay at Disney’s Art of Animation Resort and be prepared to watch animation come to life! With Disney/Pixar films Cars and Finding Nemo taking the spotlight as well as Disney’s Little Mermaid and The Lion King – this is one of the more affordable resorts and is an awesome place for all Disney/Pixar fans! Stay in one of the Cars or Finding Nemo themed rooms to get the full Pixar experience. Throw off your flip flops and take a swim in Finding Nemo “Big Blue” Pool (largest pool on Disney property!) or in the Cars themed “Cozy Cone” Pool. You can now meet Buzz in front of Slinky Dog Dash coaster and Woody and Jessie together in front of Toy Story Midway Mania in Toy Story Land! We are thrilled they brought Jessie into the new land. There’s a new show in Animal Kingdom and we’re wild for it! Senior Wilderness Explorer Russell and his furry pal Dug from Disney•Pixar’s animated hit film UP join bird experts on a new adventure featuring encounters with birds from around the world. This is the first time that Russell and Dug appear onstage at Disney’s Animal Kingdom. An original, authentic Indian musical score features themes from Disney•Pixar’s UP. Russel and Dug bring questions about the birds and a lot of humor to the show. Russel mentions Kevin, the bird from the UP movie, in the stage show. Guests will best enjoy this show if they have seen the movie and are familiar with the characters ahead of time. It’s a great show! Head over to Tomorrowland in Magic Kingdom to defeat the Evil Emperor Zurg by shooting targets to gain points while taking a ride (and controlling) a spaceship of your own! This attraction has the same concept as Toy Story Mania but doesn’t pull in the 4D effect. Still totally worth the wait or snag a FastPass+ later in the evening if one is available. Buzz flies solo over to Tomorrowland at Magic Kingdom where he meets guests just outside of his Buzz Lightyear Space Ranger Spin attraction. Who’s ready for an adventure with Nemo and Friends? Climb aboard a clamshell to ride through a slow-moving tunnel filled with REAL sea creatures, plus our favorite Pixar fish friends! This attraction ends as you are dropped off in what is known as Sea Base – a beautiful 5.7-million-gallon saltwater aquarium. We could spend all day here! Dude! Crush, one righteous turtle from Disney/Pixar, Finding Nemo, talks to you at Sea Base in Epcot! That’s right, Crush takes center stage of his aquarium in this attraction where we see into his world and he sees into ours. Kiddos sit up front and have a chance to interact with Crush by asking him questions and answering questions he might have as well! At this attraction, you have one job – to laugh! That’s right… head into this Comedy Club in Tomorrowland at Magic Kingdom to interact through jokes and laughter with some of our favorite monsters from the Disney/Pixar film, Monsters, Inc. Our favorite part of this attraction is that guests have the opportunity to text in their funny jokes before the show for a chance to have them shared during the show. The Tree of Life at Animal Kingdom isn’t just for looks! In fact, inside the Tree, you’ll find a bunch of bugs that have decided to put on a show! Head into the bug theater for a 3D experience where friendly (and not so friendly) bugs from Disney/Pixar’s A Bug’s Life film ask you to become an honorary bug for the show. This is a fun one and typically isn’t crowded – but you’ll want to think twice before taking little ones into the theater as it does get loud and dark at certain points. Nestled in Future World at Epcot, in the Imagination Pavilion, you’ll spot the Magic Eye Theater (former Captain EO location) which now holds the Disney and Pixar Short Film Festival. Slap on some 3D glasses and get ready to experience an 18-minute festival with three great Disney/Pixar Short Films in 4D! Check out this playful meet and greet in Magic Kingdom’s Fairytale Garden in Fantasyland where our favorite redhead princess, Merida from Disney/Pixar’s Brave film, greets all her fans! 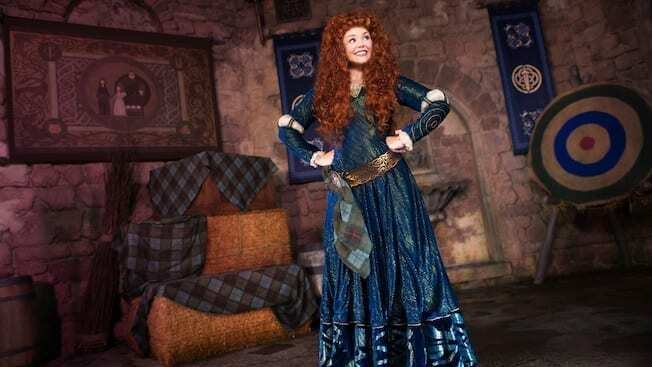 Full of energy, Merida is a burst of excitement and a blast to meet. While you wait, you might want to try shooting a bow and arrow! Joy and Sadness are hanging out in Future World at their meet and greet inside Epcot’s Character Spot location. The two are the stars of the Disney/Pixar film, Inside Out, and draw a sizable crowd with their joyful and sad personalities! Located in Discovery Island, Russell from the Disney/Pixar film, Up, is as cute as ever! This Wilderness Explorer is energetic and excited to take a picture with guests. Dug, his loyal dog, is sometimes at his side. When exploring Discovery Island, be on the lookout for Kevin, the adorable bird from Disney/Pixar film, Up. Kevin enjoys wandering, squawking, and dancing with guests. Check out the video of Kevin in action by clicking here. At the most recent Food and Wine Festival, Epcot had Remy’s Ratatouille Hide and Squeak which was an interactive scavenger hunt that took guests around the World Showcase in search for ingredients for none other than Remy’s signature dish, Ratatouille. This experience was a fun way to remember the Pixar/Disney Film, Ratatouille, and the cost was just under $10. Will this experience be back for the next Food and Wine Festival? We hope so!